We can use the lessons of the bear to learn how to look at ourselves and what is happening in our lives. And in doing so, the bear can become our teacher, our friend, and our companion. So what lessons does the Bear teach us? 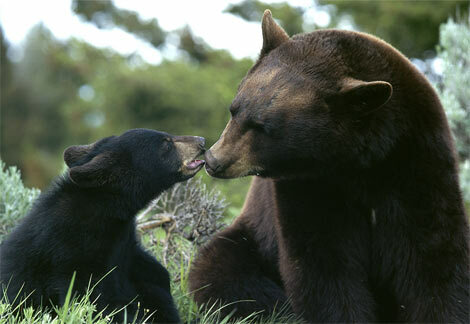 When Bear kills its prey, as it must do in order to survive, we learn that there is no life without death. Some things must die in order for other things to live. Death is not a final stage, but merely a change, a transition. Change occurs on many levels, and at many different times. Changes are blessings – they represent new growth. Yes, there may be loss… but there is also gain. Every day we are challenged in some way to let go of the old and create the new. Like the bear which must kill to sustain its own life and create the life of its future generations, there will come times when we must use that same life and death process to kill certain aspects of our lives and create new ones. But at the same time, we must remember that all life is sacred, all life is essential, and all life must be respected and honored. Death is a process of both giving and taking. We must balance both. There are times when the bear kills and feeds, and times when the bear lays down and sleeps. 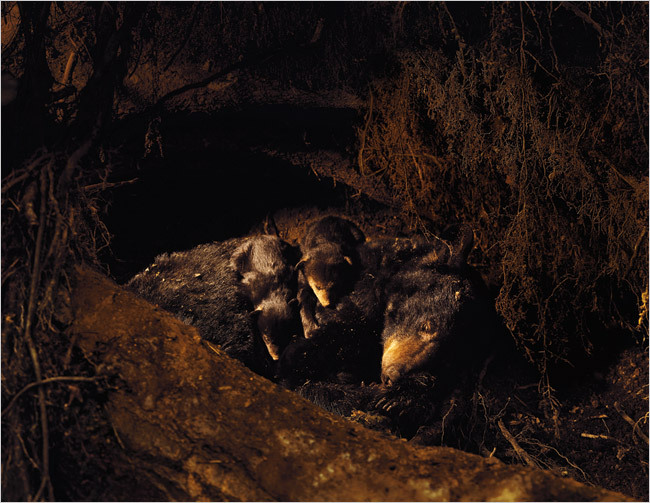 There is a time when the bear hibernates, and then comes out of the cave to be “reborn” and begin a whole new chapter in its life – a chapter which could include nurturing new lives (in the case of a mother bear and its cubs.) In our own lives, there are times to be active, and times to rest. There are times to live… times to die… and times to be reborn. It’s all part of the cycle. It’s all part of creation. Creation is a process, not a final goal. It’s a process that involves change, that involves letting go, that involves honoring life even as we must sometimes destroy it as a part of that process. The Bear also teaches us lessons of adaptation. Adaptation is the natural ability of an animal to live in a particular place in a particular manner. 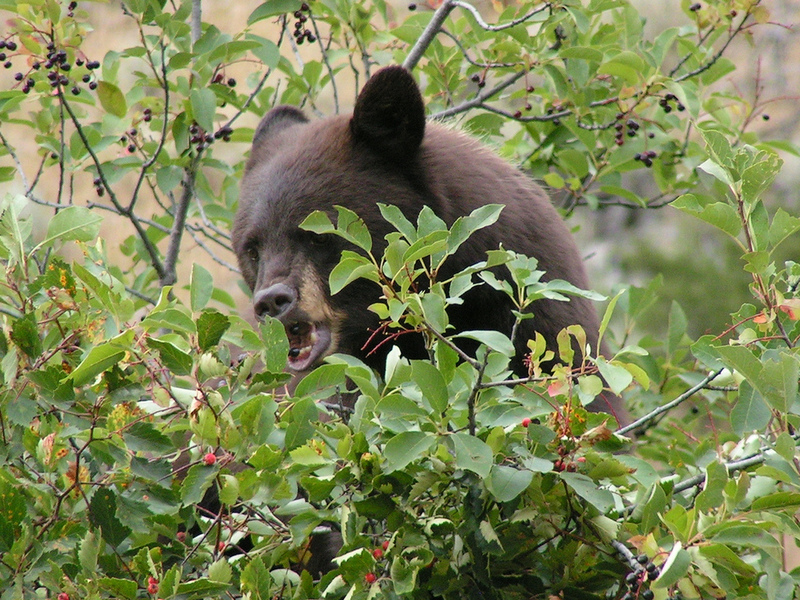 Even though bears are the largest carnivores on the North American continent, they will eat almost anything. They not only eat meat, but also plants and fruits. When the salmon are running and the rivers are filled with fish, they adapt to take advantage of the opportunity. When the wild blackberries are ripe, they can be found sitting amongst the brambles, stuffing themselves. And as humans have encroached closer and closer to their habitat, they have learned to adapt – maintaining a careful wariness, but showing a natural curiosity for these two-legged strangers… and a natural affinity for their garbage cans. Like the bear, we also must develop the ability to shift to meet the various needs that arise in our lives. Every day, we shift our energies to meet daily trials, responsibilities, and obligations. Like the bear, we can learn to take advantage of positive opportunities that work in our best interests, and avoid those situations that could be potentially dangerous for us. Every animal is unique. Each species has its own characteristics, its own strengths and its own weaknesses. The bear has its own special characteristics also – characteristics such as hibernation, strength and courage, being a predator rather than prey, being able to stand up and walk on its hind legs, etc. As a predator, it wastes little – it kills only when it’s hungry, eats its fill, and then buries the remains for later. We can learn from such a characteristic… the bear teaches us to use our abilities to the fullest and not waste what we do have. The bear generally hunts alone… which can teach us the importance of sometimes needing to be alone in order to develop our own skills and abilities. The Bear only tries to be a bear… it doesn’t try to be something that it is not. A bear doesn’t try to be a wolf, or an eagle, or a whale. It thinks and acts like a bear. In the same way, we must learn to be who and what we are, and not try to take on characteristics or behaviors that are not natural to us. Don’t try to be a bear if you’re actually an eagle, and don’t try to fly like an eagle if you’re really a wolf. Once you allow yourself to be who and what you truly are, then you must and will do what is necessary to be yourself… whether that be a bear, a wolf, an eagle, or a whale. Finally, the bear teaches us the importance of the intricate web of connection of all life. All things are interconnected. One way we are connected is through the food chain – the sun, the water, and the soil nourish the plants. Bugs eat the plants. Salmon eat the bugs. 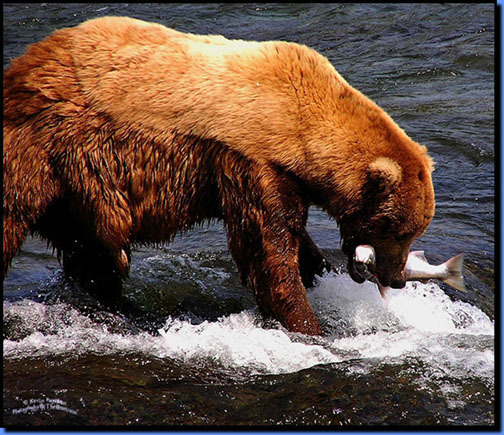 Bears eat the salmon. The energy is passed on from one source to another. Everything feeds upon and is fed upon by other life forms. The connection is real and significant. In the human world, we can learn from this process. Just like the predators and prey within the natural world, every human action is followed by a reaction from all other worlds – whether that reaction be positive or negative. Thus all action involves and requires responsibility. There are relationships, there are connections that we have with the world around us that go far beyond what we might see and perceive. Many ecologists believe that the bear is one of the true symbols of the natural world, and how we respond to the needs of the bear, and work to protect its habitat and its survival says a lot about us. It says a lot about how much we value our environment, our resources, and life in general. All things, all people, all events, and all times are connected. When we can see those relationships and follow them… both into the past and into the future… we can manifest a higher vision, and we can use the lessons of the Bear to turn our dreams into realities. Many thanks to Ted Andrews and his excellent book “Animal-Speak” which has taught me a lot about the lessons we can learn from various animals, including the Bear.